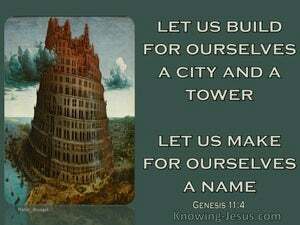 ﻿ Genesis 11:4 They said, "Come, let us build for ourselves a city, and a tower whose top will reach into heaven, and let us make for ourselves a name, otherwise we will be scattered abroad over the face of the whole earth." And they said, Come, let us build a city for us, and a tower, and its top in the heavens. And let us make a name for us, lest we be scattered abroad upon the face of the whole earth. And they said, Come, let us make a town, and a tower whose top will go up as high as heaven; and let us make a great name for ourselves, so that we may not be wanderers over the face of the earth. And they said, Go to, let us build us a city and a tower whose top may reach unto heaven; and let us make us a name, lest we be scattered abroad upon the face of the whole earth. And they will say, Come, we will build to us a city, and a tower, its head to the heavens; and we will make to us a name, lest we shall be dispersed over the face of the earth. And they said, Come, let us build us a city and a tower, whose top may reach unto heaven; and let us make us a name, lest we be scattered abroad upon the face of the whole earth. And they said, "Come, let us build ourselves a city and a tower whose top [reaches to] the heavens. And let us make a name for ourselves, lest we be scattered over the face of the whole earth." And they said, Come, let us build us a city and a tower, and its top in the heavens. And let us make a name for ourselves, lest we be scattered upon the face of the whole earth. And they said, "Come on, let us build us a city and a tower, that the top may reach unto heaven. And let us make us a name, for peradventure we shall be scattered abroad over all the earth." They said, "Come, let us build ourselves a city, and a tower whose top reaches to the sky, and let us make ourselves a name, lest we be scattered abroad on the surface of the whole earth." And they said Come on! let us build for ourselves a city, and a tower with its head in the heavens, so let us make for ourselves a name, - lest we be scattered abroad over the face of all the earth. And they said, come, let us build us a city, and a tower, whose top may reach to heaven; and let us make us a name, lest we should be scattered abroad upon the face of the whole earth. 3 They said to one another, "Come, let us make bricks and burn them thoroughly." And they used brick for stone, and they used tar for mortar. 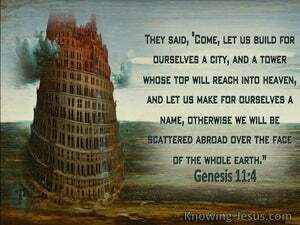 4 They said, "Come, let us build for ourselves a city, and a tower whose top will reach into heaven, and let us make for ourselves a name, otherwise we will be scattered abroad over the face of the whole earth." 5 The LORD came down to see the city and the tower which the sons of men had built.